This advanced utility is available on our official website via the batch image resizer download button. First, you get a chance to spend 30 days using it and building your personal estimate of this program. It is very likely that you will have tested all its options and made your own opinion by the time the trial period expires. 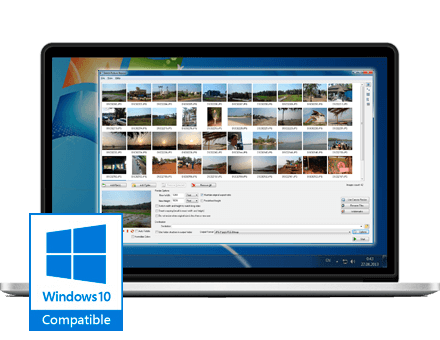 This tool goes with Windows 7, so be quick to download it and tailor your pictures as you see fit. Also, this image resizer goes with Windows XP, so you can download it if you have this Windows version too. Apart from high compatibility, this tool boasts exceptional user friendliness. You are not going to have to read manuals, just read the interface and enjoy life! To check the tool's effectiveness, run it and enter the File menu. Select Add Files or Add Folders options. In the latter case, all the images contained in the folder will be displayed. You can skip the menu and use the Add Files/Add Folders buttons. Set image width/height parameters using pixel/percentage modes. Apply Rotate options below the viewer window. Also, you can choose between colored and grayscale output images. Select the output format using the Output Format drop-down list. Press Start to resize your images and check the results.